And under the heading of, “Did You Know?” there are two manufacturers of ECT machines in the U.S. One of them is owned by two psychiatrists who loudly beat the drum for ECT. I daresay Edgar Bronfman told people that a bottle of Seagram’s Seven Crown would cure whatever ailed them. Somatics LLC, the manufacturer of the Thymatron ECT machine, is owned by psychiatrists Conrad M. Swartz and Richard Abrams. They each have published books heavily promoting their junk science masquerading as medicine. Swartz wrote “Electroconvulsive and Neuromodulation Therapies” which can be yours for the low, low price of $162.95. 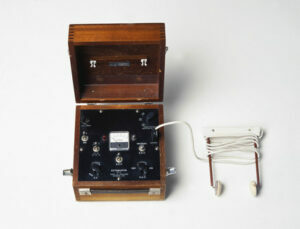 Abrams merrily penned “Electroconvulsive Therapy”, the fourth edition of which sells for $137.35. Abrams, at least, forgot to mention this tiny detail to his publisher. He also forgot to mention that ownership in this disgusting company accounts for half of his income. He declined to detail just what those sales or profits are, but supplying about 500 hospitals at $10,000 a pop adds up, I’m sure. The Somatics LLC website contains outright lies such as a denial that ECT causes permanent memory loss, something that has been clearly affirmed by medical journals and by the poor souls who have fallen victim to ECT. Anypit.com reports that “even noted ECT advocate Harold A. Sackeim has admitted that lasting memory damage is much more common than previously believed”. They have a catalog on the Somatics LLC web site in which they even offer “a one-page course in advanced ECT”. Geez, imagine that – you, too, can become an expert torturer after reading just one page. Wow! And speaking of torture, Swartz is also a guitarist in a band called – are you ready for this? – “Insanitizers”. One of their songs is “Dance Like a Robot”. He probably plays it for the poor sods whose brains he’s about to fry.